Red Shoot is steeped in family life: the present owner, Jaqui Oldfield, is the third generation of her family to run the business. She also has children of her own, so she understands the needs of families. It’s a big site – 100 pitches, 46 with electric hook-up – but the joy of this north-western part of the New Forest is that, even in mid-summer, you can walk five minutes from the site and find yourself in a secluded spot that could be miles from anyone. There’s a great play area with a fireman’s pole and rope and swing bridges, and a well-stocked shop to keep energy levels up. Next door to the site, and closely connected to it, is the Red Shoot Inn which specialises, as you’d imagine, in serving families. Plus, the area positively groans with wonderful days out: Marwell Zoo, Monkey World, Liberty’s Raptor and Reptile Centre and the New Forest Water park are all within striking distance. One of Britain’s best-known family campsites, and deservedly so, Arthur’s Field is named after the farmer who originally owned the land, and who opened it up to campers (don’t be confused by the website, which uses the site’s alternative name, Treloan Coastal Holidays). Families flock to the site, perched on the Roseland peninsula, all year round, but especially during the summer. Every morning, campsite owner Debs rings a bell at the top of the field so that children can scamper up and collect eggs and feed the animals with her; they keep pigs, guinea pigs, chickens and rabbits. That sets the tone for this creative campsite, which makes little ones in particular feel welcome. Arts workshops are also popular here, in everything from willow work to charcoal cooking. Wednesday evenings are a big tradition, with gatherings around the campfire for storytelling, songs, poetry and a communal barbecue. Treloan also runs foraged feasts, where campers go on expeditions with a wild food expert and collect food for a banquet that evening. Mobile homes and wooden snugs (which sleep a couple with one small child) are available to rent, or you can bring your own tent or caravan. There are three secluded beaches within walking distance; and for a longer day out, you can do the one-hour scenic coastal path to a place called Place, from where you can get the foot-ferry to St Mawes. There’s an excellent shop on site and a yurt pizza outlet in high season all of you will relish. The beautiful three-mile-long beach at Studland Bay is close at hand, and Swanage has lots of old-fashioned seaside activities including putting, tennis and bowls, and a couple of great fish-and-chip shops. It’s only a 10-minute walk through the dunes to the beach from Gwithian Farm, which is a big part of why it’s such a hit with families. You can be messing about on the beach by day, and listening to the waves crash on the sand from your tent by night. And there’s lots more too: a family-friendly pub directly opposite, a pretty village alongside, and goats and guinea pigs to feed. Visitors give a big thumbs-up to the family bath and shower rooms, and to the cream teas served in the garden of the thatched farmhouse. For evenings when you don’t want to cook, a mobile chippy calls in three nights a week and a curry van makes a visit on another evening. A slice of the easy life. If you’re a family with a dog, you can’t beat Beddgelert. Not only is it very dog-friendly, but from this summer they come free. Though bang in the centre of the forest, you’re only a five-minute walk to Beddgelert village, complete with a homemade ice-cream shop. The site itself has a kids’ playground, a well-stocked shop and an information room that’s full of ideas about what to do during your visit. For many families staying here a visit to Mount Snowdon is a must, and a trip on the Welsh Highland Railway, which has a stop at the campsite, is a fun way to spend an afternoon. There’s also Go Ape nearby at Dolgellau, and the Sygun copper mine up the Gwynant valley. Finally – back to dogs again – you can’t stay here without making a visit to the nearby monument to Gelert, faithful hound of medieval Welsh Prince Llewelyn the Great. The monument marks the spot where Gelert is buried; the legend is that the prince killed his dog in error, fearing the animal had killed his infant son. The hound had in fact fought off a wolf to save the child … but Llewellyn didn’t discover this until it was too late. To the cognoscenti, Kelling Heath is Center Parcs at a fraction of the price: a safe, sprawling space surrounded by miles of woodland and heathland trails, with outdoor and indoor swimming pools and bars and restaurants onsite. There’s also a rich programme of kids’ events including den-making workshops, junk modelling and storytelling walks. You can hire bikes, play tennis, go fishing and try your hand at archery – and new in 2011 for kids and adults are photography, art, pottery and dance workshops. For stressed-out parents in need of a bit of rest and relaxation, there’s a health and fitness club onsite. The North Norfolk steam railway goes through the site (Kelling Heath even has its own stop), and Amazona Zoo in Cromer – with jaguars, otters, spider monkeys and flamingos – is a must. For families who like to go camping as a big group with other families, Forgewood is perfect. There 100 pitches spread over a massive area, so it never feels overcrowded. You’re able to park your vehicle alongside your tent (especially good if you’re travelling with small kids and a car full of clobber). The site is adjacent to a 300-acre country estate with its own deer park, lake and Victorian follies – so once you’ve got yourself there, you don’t need to venture offsite at all. New this year is an expanded menu in the barn restaurant. For those who do want to explore further afield, though, there’s lots to do: Ashdown Forest (home of Pooh Bear’s 100-Acre Wood), Bewl Water Outdoor Centre (for cycling, walking and watersports) and a climb up Harrison’s Rocks. If you’re after a tiny campsite tucked away down a country lane, with just a handful of other families and virtually everything you need right there waiting for you, Polgreen is the place to go. 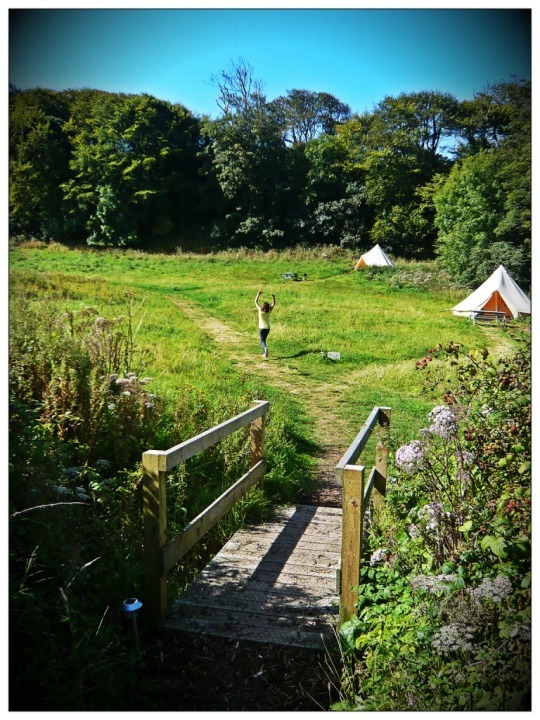 Situated on the north Cornish coast, it’s a 20-minute walk to the beach (complete with surf hire and cafe), and accommodation is in capacious bell tents, with new, five-metre tents for the 2011 season. Polgreen only opened two summers ago, and it’s very much an add-on to a working farm – you can tour the lakes to hear all about fish farming, and help feed the pigs. It’s open only for a month at the height of summer – check the website for details. As well as your family bell tent, which comes with cooking equipment, there’s a communal tent with a sofa, and barbecues with canopies in case of rain. For days out, explore the National Trust beach at Bedruthan Steps, the aquarium at Newquay, the Eden Project or Watergate Bay. If you’re looking for a place where the kids can hang loose, build dens, get close to nature and learn about birds and plants, you won’t beat Jerusalem Farm. Nestled in one of the most picturesque wooded valleys in the Pennines, it is an excellent base for cycle rides and country walks. There’s a riding school nearby, as well as an adventure playground – but this isn’t a site with a huge amount of infrastructure. Rather, it is simply a beautiful place without lots of frills for families who relish roughing it a bit. And if they do happen to tire of the outdoors, nearby Halifax is the home of Britain’s first dedicated (and very interactive) children’s museum, Eureka, with gadgets and gizmos galore. If you have older kids in search of an adrenaline high, this place has it all: watersports, mountain biking and several munros (mountains over 3,000 ft). While the teens are off gallivanting, younger ones can wander the edges of Loch Long or spend all day crab fishing. There’s a children’s play park on the site, and a cafe that does a brisk trade in bedtime hot chocolate. Kids also enjoy the wildlife – birds and dragonflies are a speciality – but beware the midges. Insect repellent is a must, and can be bought in the onsite shop. With Thanks to The Guardian.